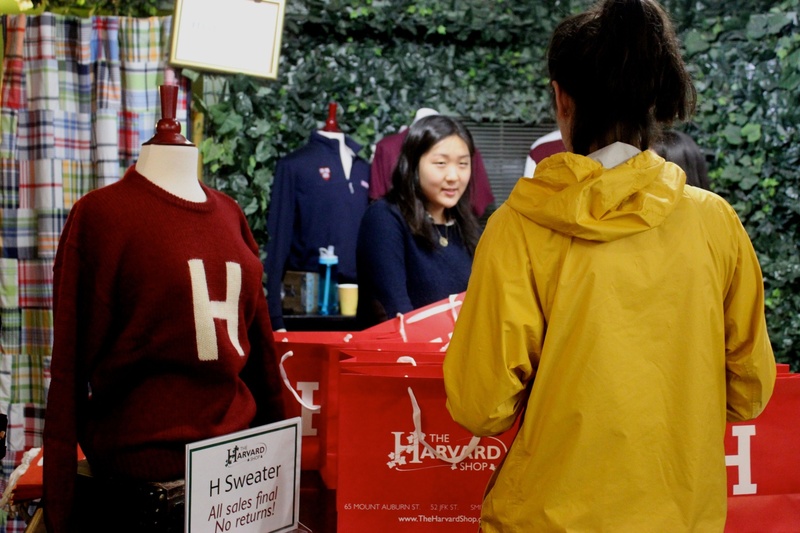 UPDATED: October 29, 2015, at 7:10 p.m.
Jessica Li ’17, the managing director of the Harvard Shop, surveys her store a few minutes before the afternoon’s sale event begins. It looks nearly perfect. The freshly vacuumed carpet narrows toward the back of the room, where seven red bags sit neatly on a table of oak. Beside them, a headless mannequin models a crimson sweater, emblazoned with a giant H. Three plastic boxes hold the rest of the merchandise below. The patchwork curtains that close the shop’s single changing room hang slightly open, revealing a lit floor lamp casting shadows on a back wall covered in fake ivy. The Harvard Shop on Mt. 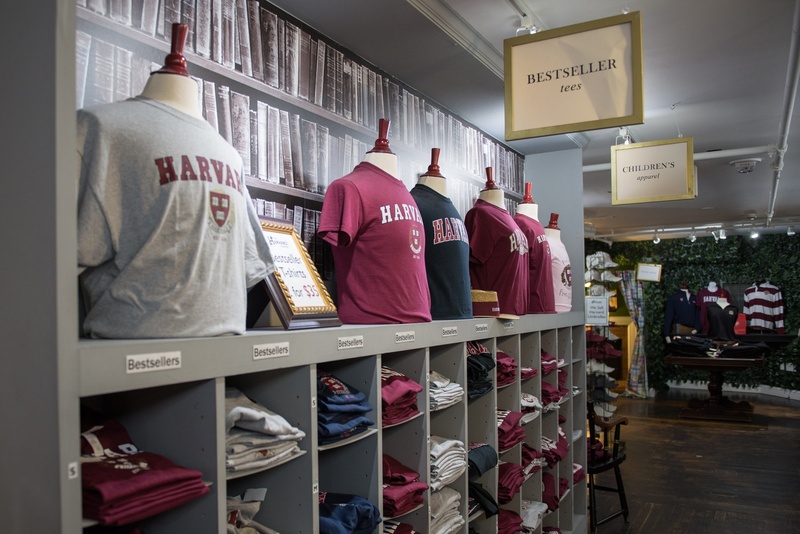 Auburn Street sells a variety of Harvard memorabilia, from popular t-shirts to newer items like teddy bears and phone cases. The Shop moved in 2013 to its current location across from Lowell House. Diana Im ’17, the Shop’s marketing manager, places one last red bag on the table just as the first customer opens the door. After stopping for the promised complimentary Pinkberry sample, the customer approaches the table, hands in the pockets of his gray sweatshirt. Im greets him, while Sarah Miller, the Shop’s full-time retail manager, checks off his name on a clipboard. Customers ordered the sweaters, in limited supply, beforehand. The Shop had sold out of the sweaters several hours before the event. Diana Im ‘17, an employee at HSA’s Harvard Shop, prepares to give a student her H sweater at the sweater’s release party in late September. At first, Li lingers with the cashier, but when the customer steps behind the curtains, she walks toward the back of the room. Before she can reach the table, though, Jordan M. Donald ’18, the Shop’s e-commerce manager, stops her for a picture. Donald spent his summer redesigning the Shop’s website and conducting A/B testing for user-friendliness. Today, in the brick-and-mortar store, he’s on photo duty. Donald gets a few shots of Li holding a sweater-clad stuffed panda (the store started selling stuffed animals this year), but has to move his heavy camera out of the way as more customers file in. By about a quarter after four, the line has a steady stream of students, and Im’s head keeps dipping under the table as she pulls out more sweaters. Jessica Li ’17 poses for a picture at the H sweater release party in the Harvard Shop. The sale event is mostly Im’s brain-child; she wanted to distinguish the Harvard Shop’s H sweaters from similar products at Hillflint, J. August, and the Coop. While Donald worked on the website, Im developed a blog, designed to display Harvard Shop products in the context of student life. In the week leading up to the sale event, she posted interviews with four students modeling what she called “edgy,” “silly,” “preppy,” and “California cool” looks. Roughly 100 students applied to model these sweaters. This seems to be the marketing philosophy behind the Shop’s H sweater, and its ivy-covered back wall: To sell products, sell Harvard. Chances are, too, that if you go to Harvard, you’ve used HSA’s services. If you’ve subscribed to a laundry delivery service, purchased a University-sanctioned microfridge, or consulted a “Let’s Go” guide, you’ve used HSA’s services. If you’ve purchased a sweatshirt from your club sports team, picked up a flyer from the basket outside your room’s door, or even grabbed a copy of The Crimson from your dining hall… You get the idea. 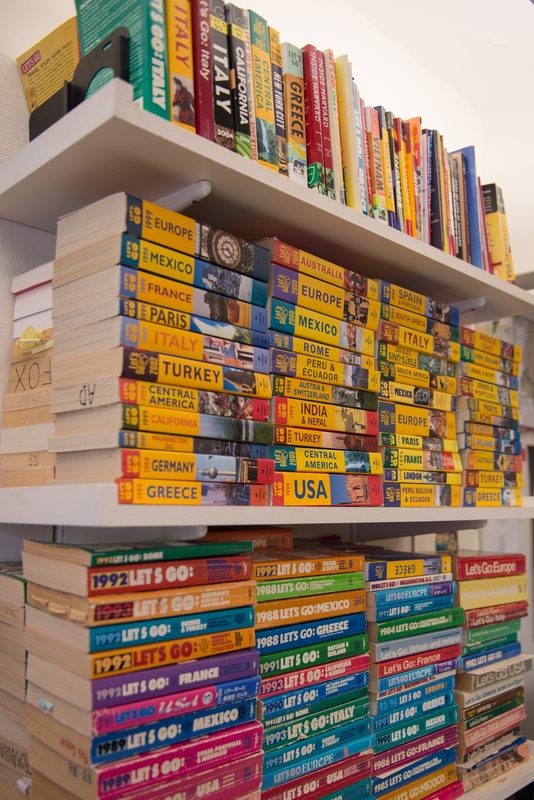 Let’s Go, a travel guide written by Harvard Student Agencies employees, is one of HSA’s oldest and most successful branches. Harvard Student Agencies—a 501c(3) nonprofit of which the Harvard Shop is a for-profit subsidiary—is unique among student organizations. Employing more than 585 students, including about 40 student managers, it services nearly all of Harvard while providing students with real-world business experience and a springboard for future careers. It’s unique among entrepreneurial ventures, too. Drawing on its longstanding relationship with the University, HSA offers an alternative to the striking-out-on-your own start-up model, providing administrative support, alumni connections, and a financial safety net. By 4:30 p.m., customers have trickled out and everything’s nearly wrapped up. There is only one detail left to finalize: where to go for dinner. Someone suggests Thai food, a table for 10. In 1957, University administrators discovered 14 students selling beer mugs, class rings, and personalized stationary out of their dorm rooms. According to HSA’s “A History: 1957-2012,” “these budding tycoons placed Harvard’s real estate tax exemption in danger.” In order to maintain both the tax exemption and student jobs, then-Dean of Financial Aid Jon Monro ’35 and then-Director of Student Employment Dustin M. Burke ’52 launched plans to incorporate Harvard Student Agencies as an official, student-run, and student-owned business. HSA failed to make a profit for five consecutive years between 1970 and 1975, but its financial situation improved when managers adjusted the fiscal year and accepted a loan from the University. It published “The Unofficial Guide to Harvard” and an alumni newsletter called “The Entrepreneur.” In 2002, HSA acquired the Harvard Shop from a local shop owner named Paul Corcoran. Today, Harvard Student Agencies includes 14 individual businesses (the “agencies”) run by about 40 managers (the number fluctuates from year to year). Those managers, in turn, oversee about 585 student employees, who stock the Harvard Shop, deliver laundry, and tutor high school students, among other services. It has a permanent staff of four full-time employees, seven University-affiliated directors, and seven alumni directors. The agency has a separate graduate board, as well. In 2013, HSA’s most recently reported fiscal year, its not-for-profit agencies brought in $1,777,193 in revenue, with its private subsidiaries accounting for the rest of its $5 million total. It owns four Harvard Square venues, one for the Cleaners and three for the Harvard Shop. (The Shop must vacate the Smith Center, however, due to the upcoming renovations). HSA tells its own recent history in the stairwell of its headquarters in Burke-McCoy Hall. A series of manager portraits charts the development of HSA’s agencies, in chronological order, from the bottom to the top of the stairs. 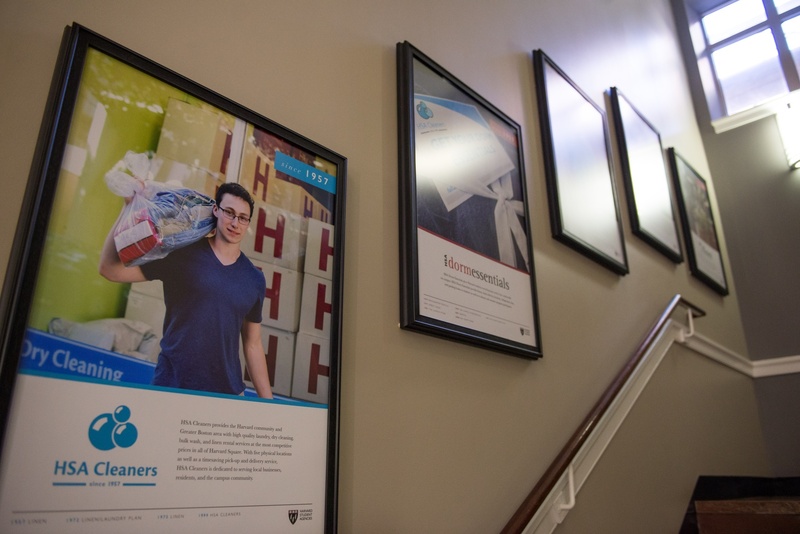 A poster of HSA President Patrick F. Scott ’16 advertises the Cleaners, one of the organization’s various services, and hangs in its office at 67 Mt. Auburn Street. These posters show the services of the agency, in chronological order of their creation. Molly C. Alter ’16 wants to get the shot right. She adjusts the heavy curtains that hang over the floor-length windows in the Adams Upper Common Room. It’s raining outside, and the lighting’s not quite right. She pushes a heavy blue chair back, and then forward again, and looks at it from behind the black camera (a Blackmagic—“our pride and joy”). “What do you think about the image of all three of us in chairs in front of the fireplace?” asks Ben D. Sorscher ’18, Alter’s technical director. Silvano D’Agostino ’18, her creative team director, tilts his head to the side. Alter considers. “That’s a little Mafioso,” she jokes. Alter manages Mt. Auburn Productions, an HSA agency that produces videos and multimedia content, primarily for University affiliates. Like HSA’s 40 other student managers, she works about 15 hours a week during the school year and 40 over the summer. Managers earn between $5,000 and $12,000 a year, depending on how their hours compare to that average commitment. Today, Alter and her team are shooting their own promotional video. Alter returns to the windows, her black heels clicking against the floor. She brainstorms her introduction: “I don’t want to say my name—should I say my name?” She wonders whether the video should mention the agency’s website, or the size of its staff. Sorscher tightens the tripod, and Alter sits on the blue chair. Technically, Alter’s not a filmmaker by training. Prospective HSA managers interview for non-specific positions, and Alter got the necessary technical instruction on the job. When HSA hired her last October, she couldn’t identify a memory card. Now, she oversees a 25-member production team and a growing clientele. HSA does not expect its applicants to have any prior industry experience, and most don’t—just a desire to learn. 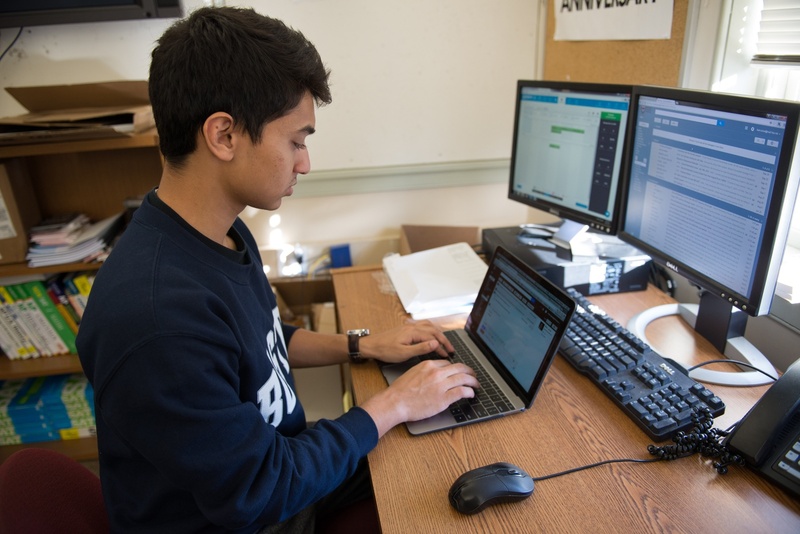 Arman K. Hassan ’18, the Services Manager for HSA’s Harvard Bartending Course and Bartending Services, spends about 15 hours a week working on registration, scheduling, inventory, among other tasks. Arman K. Hassan ’18, the manager of Harvard’s Bartending Course, cannot legally drink. I meet him outside the Queen’s Head Pub a few hours after the six-hour long class. Hassan received a light blue personalized card under his door freshman year, inviting him to apply for a management position at HSA. Like Alter, Hassan interviewed for a non-specific manager position, and the bartending agency came as something of a surprise. “I was 17 when I came to campus—I felt young to be running this kind of business,” he remembers. Hassan manages about 35 bartenders and servers, and runs an average of three courses each season. Over the summer, he decided to create an online version of the course. Today, he’s at the Queen’s Head late to wrap up filming. Hassan still can’t legally drink. “Sometimes you do get bitter looking at the stuff you can’t do,” he muses. Reynolds first worked as a manager of customer orders at The Harvard Shop before becoming a manager and eventually, HSA’s president in 2014. 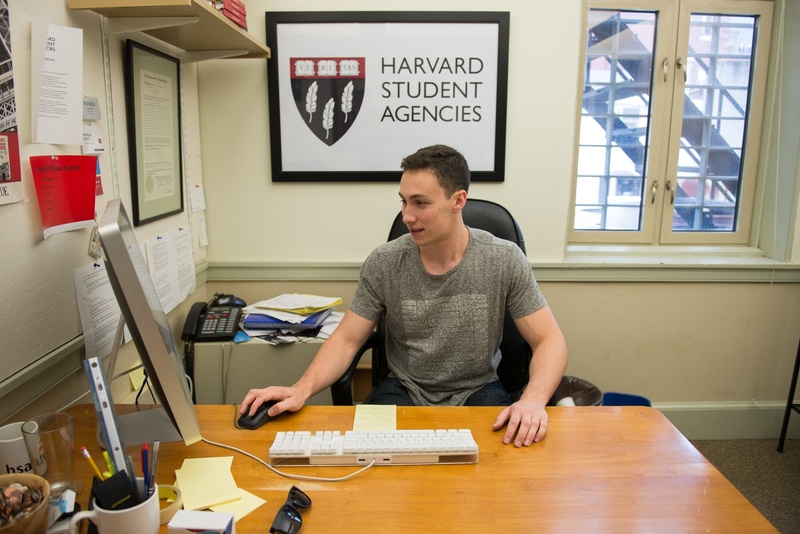 Patrick F. Scott ’16, president of Harvard Student Agencies, responds to e-mails in his office in the HSA building. Scott first joined the organization as a laundry deliverer. When I meet Patrick F. Scott ’16, HSA’s current president, in his office, he tells me that he, too, worked as a delivery associate before applying for a management position. Scott, who wears a simple white T-shirt and glasses, often references a list taped to the wall next to his desk. It’s a reverse to-do list of sorts, citing what Scott has accomplished in the first half of his presidency. 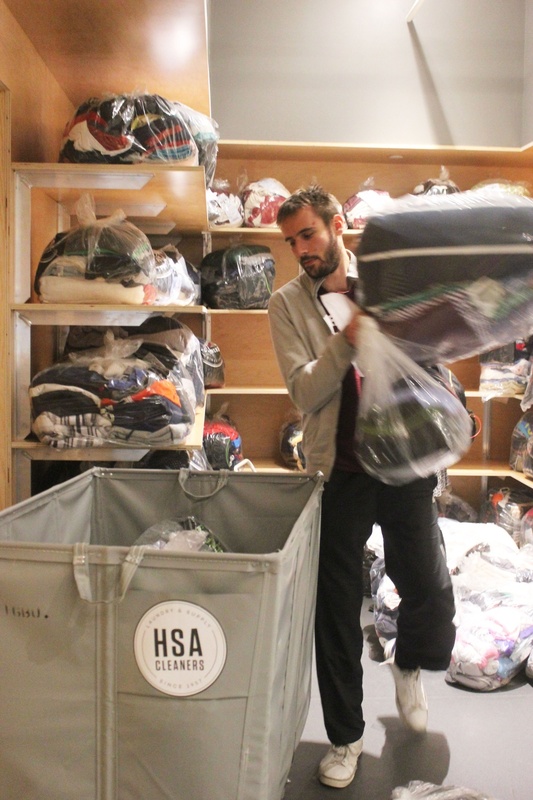 Luka Kordic loads bags of laundry off the shelf in preparation for a delivery run to the Yard dorms. I meet Luka Kordic ’17 at HSA Cleaners on a Wednesday evening. The sun has just set, and Kordic thinks that he can complete his shift in one quick run. Not literally, though. “I can do this shift in about 45 minutes because I walk really fast,” he tells me. “Some people run, but I have long steps.” Kordic stands over six feet tall, and can reach the top shelf of laundry bags without standing on his toes. Tonight looks promising because Kordic only has to deliver “green” bags: HSA-speak for clean laundry routed to the Yard. “Red” bags go to the river, and “white” bags contain dirty clothes. Kordic, who estimates that he has delivered over 4,000 bags since he started working as a freshman, has a strategy for each route. In the Yard, he starts with Grays or Wigglesworth and work his way backwards. The difficulty of the shift depends on the size of the bags as well as their destinations. Kordic hands me a small plastic bag containing only a neatly folded pink blanket, a few T-shirts, and several rolled up pink-and-white socks. I can lift it easily. Then he hands me a bag three times its size, containing, among rumpled sweaters, a large navy blue duvet. When I nearly fall over, Kordic grabs it back and raises his eyebrows. The real test of strength, though, is the winter. “When the snow falls, that’s when you see who’s for real,” Kordic says. “I personally love winter because I can handle the cold well. I deliver in minus 20 degrees Celsius, and this is my standard shirt.” Kordic wears a light cotton T-shirt under a thin gray sweatshirt, which he usually takes off by the second or third dorm. Kordic throws the last numbered bag into a large gray, canvas cart, and pushes it outside. In the cold air, Kordic leans over the cart, pressing his stomach on the soft pile of bags and spreading his arms. “I like to do this,” he says. Luka Kordic loads bags of laundry into a cart in preparation for delivery. Kordic likes delivering during the winter the best because he “can handle the cold” and the job pays well. Then we’re off. Kordic does indeed take large strides—I have to run to keep up. Because delivery associates get paid by the bag, not the hour, it’s in Kordic’s best interests to move quickly. Though delivery associates make $1-$2 per bag on regular shifts, those rates double and triple when covering someone else’s shift. Kordic once made over $200 in one hour. In Wigglesworth C, Kordic throws a laundry bag up the last flight of stairs. It’s a straining job, but it pays well and he likes the management. Kordic told me that he’s lost a bag only once—but his manager didn’t dock his pay. “The workers are happy,” he tells me. “We can bring Bernie here,” he says, referring to Bernie Sanders, the Democratic presidential candidate. Scott took over management of the Cleaners when his then-boss quit. He continued to work one delivery shift per week, something he now encourages all of his managers to do. James M. Graham ’17 worked as a sales associate at the Harvard Shop last year. A single employee typically mans the facility at any given time. Managers check in to make sure that employees tidy the Shop and empty the cash register at the end of the day. Kordic says that managers have it tougher—especially at the Cleaners, where parents often call in to ask about their children’s clothes. That’s one reason why he decided not to run for a management position when his superiors recommended him for one. He wants to have his summers free to travel, and semesters free to work for a student-founded educational start-up called IvyMinded. As we exit Hollis Hall, he suggests that I apply for a delivery job. “I know girls skinnier than you who do it,” he tells me when I look skeptically at the duvet-containing bag. While managers must negotiate interactions with student customers and employees, their superiors must maintain a more delicate relationship—with the University administration itself. Since its founding, HSA has had a special bond to Harvard. According to the organization’s 1958 brochure, “the policies and regulations of the University affecting student businesses may be developed and communicated.” Five University officials staffed HSA’s first board. Since HSA’s early years, the University has afforded managers special privileges, such as concession rights at football games and permission to deliver birthday cakes to student dorms. University officials have also asked HSA to supervise potentially problematic student ventures. When several College and Business School students began operating a charter flight service that violated regulations, HSA formed Europe by Air to absorb that group. On other occasions, the University helped HSA with its financial matters. When HSA failed to break even in the early 1970s, the University offered a $60,000 loan in exchange for the right to review the organization annually and appoint an additional University-selected board member. Since its founding, HSA has attracted criticism for what a 1963 Crimson editorial described as a “quasi-monopolistic position which its intimate relationship with the University ensures.” The op-ed cited the position of Burke on both the HSA board and the Student Employment Office as a “conflict of interest.” When HSA took over Europe by Air, some students accused HSA of unfairly inflating flight prices. In 1985, the Harvard Entrepreneurs Club criticized HSA’s exclusive permissions to advertise goods and services beyond college newspapers. The College’s Office of Student Life also often reaches out to HSA for collaborative efforts. Last year, HSA ran a booth out of the pop-up ice skating rink in the Science Center. It has also partnered with the Undergraduate Council to provide shuttle transportation to Yale for the annual football game when it takes place in New Haven. Thomas R. Eisenmann ’79 MBA ’83, an HSA board member and Harvard Business School professor who studies the management of new ventures, acknowledges that HSA’s special position “does constrain entrepreneurship in some small ways.” However, he believes that the dorm room delivery policy also guards against safety and sanitary hazards. Christopher A. Smiles ’15, a former managing director of the Cronin Center for Enterprise (an agency targeted at business education) and the co-founder of HSA’s most recently established agency, College Copywriters, defends the policy on similar grounds. “Imagine a world where Goldman Sachs is going door-to-door to poster,” he says. 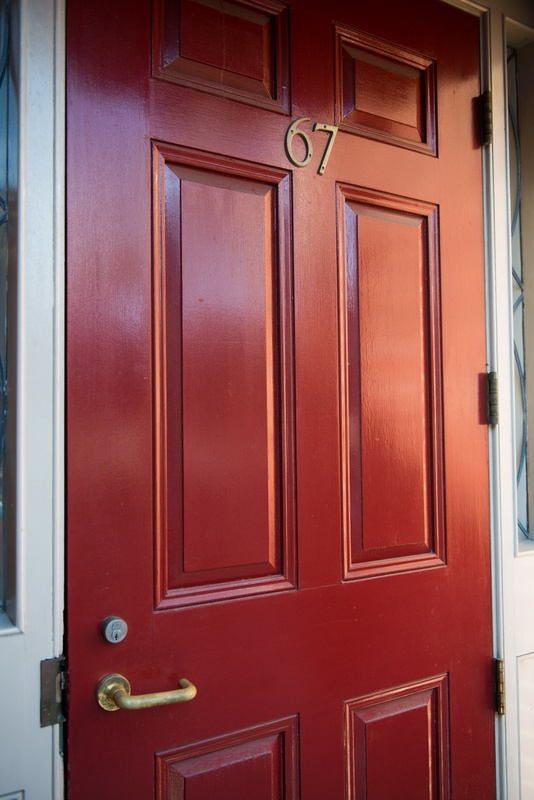 Harvard Square businesses can, however, advertise in student dorms through HSA’s door-dropping agency, Harvard Distribution. According to the executive director of the Harvard Square Business Association, Denise Jillson, HSA pays an annual fee of $290 to belong to the HSBA. Jillson connects local businesses like Pinkberry, Pinocchio’s, and Mint Julep to HSA. Most recently, HSA has suffered criticism after administrators pressured the student delivery service InstaNomz to shut down in 2014. In the start-up age, when any dorm-room business might become the next Facebook, HSA’s special relationship with the University affords it a unique position in the entrepreneurial landscape. On busy Sunday evenings, Lamont Café has just a few open seats. At the rounded end of the café counter, four sophomores sit in a tight semicircle, laptops open to identical documents. The boy in the blue sweater asks the curly-haired girl if she’s finished her problem set, but then it’s down to business. In a little less than 12 hours, the team will pitch a new agency to HSA’s incoming president, Stephen W. Xi ’17, and a few other employees as part of the manager application process. Stephen was a procurement manager for the Harvard Shop in FYE 2015. He’ll take over as President in February. 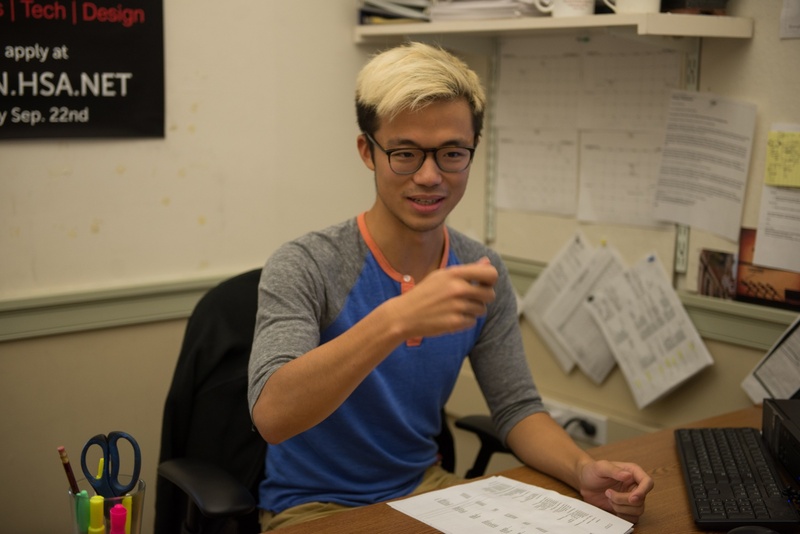 As a freshman, Xhafa worked for HSA Tutoring, offering SAT, ACT, and AP preparation to Boston high school students. He got to know his manager, Ronia Hurwitz ’18, who suggested that he apply for a higher position this fall. Xhafa took her advice and filled out an “early bird” online application. A few weeks later, he interviewed with Xi and two other managers. Then, he received a congratulatory email inviting him back for a second round. When Xhafa arrived at HSA headquarters, he met three other applicants and received instructions for writing a two-page pitch as a group. Xhafa, who also runs his own start-up tutoring company, called Lionizer, proposed an idea to purchase bikes, furniture, and appliances from graduating seniors and resell them to students the next semester. By Sunday evening, his team just needs to go over the small details: how many movers and inventory specialists they’d need to hire, whether the proposal should be single or double-spaced. “I’d prefer just casual,” Xhafa says, and everyone laughs. Two weeks later, Xhafa tells me that the pitch must’ve gone well—he was offered the procurement manager position at the Harvard Shop. Xhafa later decided not to take the job. Like Kordic, he wanted to keep his summers free. A few days later, Xi and I discuss his plans for this year’s new management team. Xi tells me that he ran on a platform of “21st-century innovation.” He wants to empower his managers to develop new initiatives within the company, particularly digital ones. According to Donald, the Harvard Shop e-commerce manager, this application cycle emphasized technical skills and creativity. HSA has consistently developed and acquired new agencies throughout its history. Recently, though, it’s faced increasing pressure to promote individual entrepreneurship as a central value of the organization. To teach students to run 21st-century businesses, HSA must teach them to start ones, too. For students seeking entrepreneurial training, HSA offers a comfortable alternative to the high-stakes start-up scene. Smiles, the former Cronin Center manager, and his best friend, Brian Deener, wrote copy for a Florida start-up the summer before their freshman years at Harvard and Emory, respectively. They started to toss around ideas for an application that would connect business owners to college students willing to write fresh copy. Smiles worked on the project for CS50, but then laid it aside until the summer before his senior year here, when he took two months off from the Cronin Center to work on the project with Deener full-time. That summer, Deener and Smiles connected 1,200 students from colleges across the country to 500 copy orders. But when the school year picked up again—with Cronin Center responsibilities for Smiles, and a term-time internship for Deener—they realized they wouldn’t be able to continue working at the same speed. He had mentioned the project to Jim McKellar, HSA’s General Manager, who suggested that HSA might be interested. Smiles and Deener pitched the project to HSA’s Vice President Bryant J. Yang ’17 over the summer, and closed the deal by August. Smiles could not disclose the final price. 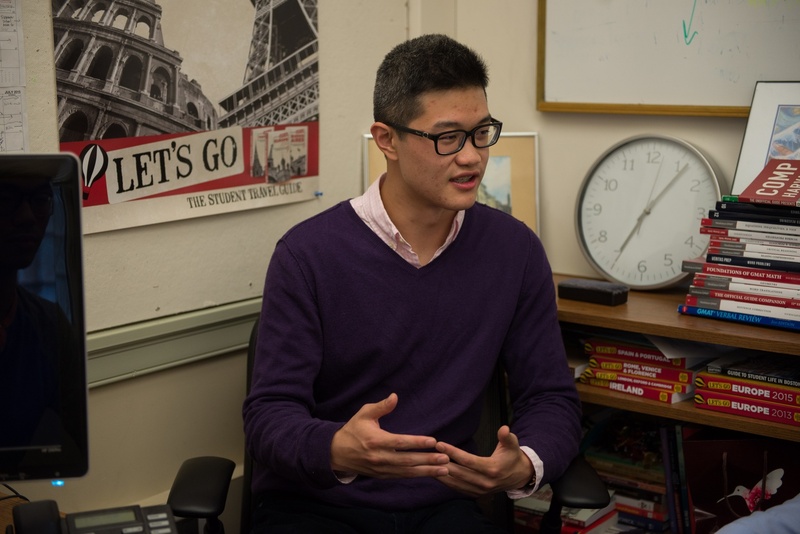 Though Amy Zhao ’18 took over management of College Copywriters in September, she’ll soon pass it on to a new manager—Smiles’s younger brother Will, a freshman. Yang was a GroupGear manager in FYE 2014, and Vice President in FYE 2015. He has also served on the Board of Directors for both HSA and the Harvard Shop since Fall 2014. “[When I found out] I was like, I should’ve paid my brother as an intern!” Instead, Smiles flew up from Florida, where he plans to work in real estate before enrolling in the 2+2 program at Harvard Business School, to train his younger sibling. When I meet McKellar, he’s about to get pranked. A few minutes into our interview, Yang knocks on the door and tells McKellar that someone’s arrived to buy “ad conglomerate.” McKellar waves Yang away, but then someone opens the door. “Ha! Ad conglomerate!” It’s an old friend of McKellar’s from the Illini Media Company, a non-profit student media company based out of the University of Illinois Urbana-Champaign, where he received his MBA. They haven’t seen each other in about 25 years. McKellar has been working with student businesses for just as long. When he heard about HSA while working at Babson College, it sounded like a natural fit. When I ask McKellar how the student entrepreneurial scene has changed since the start of his career, he pinpoints the opening of Harvard’s iLab as a turning point. McKellar says that this trend is a “win” for HSA if the corporation can “bring them in,” and to that end, he’s encouraged HSA to support independent student businesses through Harvard’s i3 Innovation Challenge. McKellar, a judge and co-founder for the i3, created an “HSA Award” in 2008 that would fund fitting start-ups and provide workspace on the fourth floor of the HSA headquarters, Burke-McCoy Hall, located at 67 Mt. Auburn St. Under McKellar’s guidance, HSA has actively sought to acquire and aid student start-ups; infiltrating the tech world has become something of a business strategy. That “win” McKellar speaks of can be hard to come by, though—start-up culture romanticizes the lone venturer, after all. Students who do start their businesses through HSA often expand beyond its walls. Annie Wang, formerly a member of the class of 2011, and her classmates, Windsor G. Hanger ’10 and Stephanie M. Kaplan ’10, won the HSA Award for their “online community for college women,” HerCampus, in 2009. Wang and her team have kept in touch with Jim, but they moved out of the HSA space after winning the MassChallenge in 2011. When Hanger and Kaplan graduated, Wang left Harvard to pursue the venture full time. For Tuan A. Ho ’09, HSA also provided something of a launchpad. In the summer of 2010, Ho was living in Dunster with his best friend, Nicholas B. Krasney ’09. The two wanted to watch Conan O’Brien, but their dorm room, like others, did not come with cable TV. So, Ho and Krasney plastered a wall with aluminum foil and tried to pick up signals from local Boston stations. When a friend jokingly asked if she could pay for the foil, Ho and Krasney decided to put together a pitch. Like HerCampus’s founders, the team worked in the incubation space on the fourth floor of Burke-McCoy Hall. On the night of the i3 awards ceremony, they met Jim McKellar, who had heard about the project from i3 co-founder Paul B. Bottino and another student, Nicholas J. Castine ’10. McKellar expressed interest in the project and the founders agreed to share the revenue for a new student television service—dubbed Tivli. Tivli became Philo, a company that now services over 40 universities. Like HerCampus, Philo outgrew its HSA beginnings, but Tuan says that he doesn’t think it would have succeeded on its own. The fourth floor of Burke-McCoy has since been converted to classroom space for the School of Engineering, and the i3 stopped offering a specific HSA Award in 2011. Still, HSA offers resources and University access to start-up founders. Chung did not belong to HSA as an undergraduate, but says that he was “a very good customer” of its laundry delivery service and “Let’s Go” travel guides. Chung, a former Crimson editorial executive and co-founder of a seed capital program, XFund, advised on the College Copywriters acquisition, among other new projects. He believes that HSA should capitalize on its relationship with Harvard to make itself a strong force in the start-up scene. Of course, having the idea for the next Facebook might not have quite the same cachet if it comes through HSA. Many student entrepreneurs might prefer to work on their own. If those companies offer delivery services, they may face pushback from the University. In 2014, Akshar Bonu ’17 founded InstaNomz, a student-run food service that partnered with Harvard Square restaurants, with his partner, Fanele S. Mashwama ’17. After Bonu and Mashwama advertised their company on their class Facebook group, they received an email from Ivy Yard Resident Dean Michael C. Ranen informing them that they had violate the school's business policies. Ranen referred them to Friedrich, who advised them to partner with HSA. However, the founders could not come to mutual terms with HSA and had to shutter the business at Harvard. I asked Friedrich what he thought of such headlines. “We have policies in place that allow students to start businesses that are independent, resources through the iLab,” he says. Bonu and Mashwama ended up developing Instanomz in the Philippines. Smiles, who helped Bonu and Mashwama navigate the negotiations, says the event was sensationalized at the time. Xi suggests that HSA’s partnerships with start-ups typically come about when founders approach the agency. “It’s kind of difficult to reach out to start-ups, especially if they’re not institutionalized,” he says. Ten business school admissions officers sit on the oak window-seat on the second floor of the Harvard Faculty Club. They address a crowd of 80 or so students, whose interpretations of “business casual” seem to vary widely. Most wear button-downs and blazers, but Ingrid Y. Li ’17, the managing director of the Cronin Center, wears a floor-length gray dress. 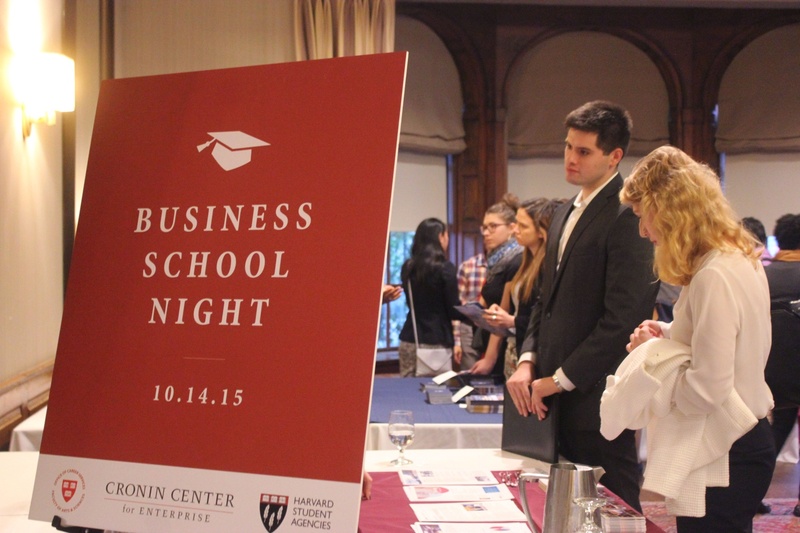 Li created Business School Night. The panelists—representatives from Georgetown, Duke, Chicago, and Harvard, among other schools—corresponded with Li over the summer. She also hosts HSA’s Business Leadership Program, a weekend-long event where students learn the case-study method and network with recruiters. Students interested in applying to business school converse with recruiters from various universities at the Cronin Center and HSA’s Business School Night. Even as HSA works to acquire student start-ups and promote digital innovation, it remains a launchpad for traditional business careers. The donors “Hall of Fame” also lists Thomas G. Stemberg ’71, the founder of Staples, Richard M. Burnes ’63, a co-founder of Bloomberg, and Ken J. Powell ’76 the CEO of General Mills. Its board of alumni and graduate board also include prominent business leaders, who are more than willing to help current HSA managers apply their experience to the real world. Nathaniel S. Rakich ’10, who worked for Let’s Go while at Harvard, worked with the Harvard Alumni Association to build a database of 4,000 alums of HSA. According to Rakich, the size of the database enables him to connect students with representatives from nearly any field. Rakich, who currently freelances as a writer, has introduced students to alums in the media. He facilitates a summer “externship” program that allows managers to work for an outside company for two weeks. Last year, he helped former Let’s Go manager Claire M. McCLaughlin ’15, a former Crimson blog executive, shadow a reporter at ABC News. Rakich also said that he’s passed on information to Scott, who hopes to work in the public sector after graduation. Alter worked as an ACE Marketing Intern at Microsoft over the summer. Her recruiter was an HSA alum, and she believes that connection got her a first-round interview. Reynolds, who now works as an analyst at Insight Venture Partners, said that she did not get that job through a direct HSA connection, but did seek advice from a number of alumni during the job search. On a rainy Friday morning, Im has the third floor of the HSA headquarters almost entirely to herself. She sits in an office chair in the Harvard Shop’s large cubicle, under a whiteboard scribbled with inside jokes—“egregious!”, “That’s jank city.” In a few minutes, she and Donald are scheduled to train the new manager taking over both their positions in the fall. For now, Im catches up on her reading. By the time Donald and Max Shen ’18 arrive, they’ve already started to bond. “We were in Straus together!” Donald exclaims as he shakes off his jacket. Over the next few hours, Im, Donald, and Shen pour over every detail in their 20-page long operations manual. Donald talks about the site’s new aesthetic. The redesign’s nearly complete, but he hopes to add more banners and promote the site on GoogleMerchant and Yelp. Im shows the new manager the Shop’s Instagram account and her blog, pausing on a picture taken at Donald’s birthday party. She hopes Shen can start posting, soon. An earlier version of this article incorrectly stated which administrator emailed the founders of InstaNomz informing them that they had violate the school's business policies. In fact, freshman resident dean Michael C. Ranen, not Associate Dean of Student Life David R. Friedrich, emailed the students. An earlier version of this article also incorrectly stated the class year of Akshar Bonu. In fact, he is a member of the Class of 2017, not the Class of 2015. An earlier version also misspelled the last name of Paul Corcoran. Lastly, an earlier version also incorrectly stated the job Ryley Reynolds started with at HSA. In fact, she was first a manager of customer orders at The Harvard Shop, not a delivery associate at HSA Cleaners.